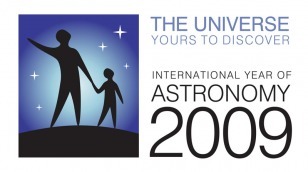 The vision of the International Year of Astronomy 2009 (IYA09 in English or AMA09 in French) was to help the citizens of the world rediscover their place in the Universe through the day/night time sky, and thereby engage a personal sense of wonder and discovery. In Africa and Gabon, the driving theme was Astronomy for Education. The aim was to use the IYA09 as a platform to reinforce the need for a stronger culture of learning, both formally and informally, for a radiating Gabonese society in the African Renaissance. Gabon is home of some of the most ancient inhabitants of Africa and the world : "Akoula" (Baka) - in one Bantou language. As such, Gabon is a host of one the most ancient form of Natural Science whose concerns included the heavens. We need to tap onto this wealth. In so doing we will better highlight native Africans' contributions towards our understanding and use of basic Laws of the Universe. A collateral benefit of the latter being the local strengthening of modern day astronomy & space science visibility and usefulness. In fact, in using local slang, the central aim is to prove that "yes, one can eat Space" (be fed by). Beyond the International Year of Astronomy is the natural extension to IYA09. We are expanding upon the momentum gained in 2009. In Gabon & Africa, Astronomy for Education remains the motto. We are looking far ahead and confidently, given that Africa will be - once more - the dominant world power by 2050. And the use of space (at large) will play a crucial part. With the 2013 total solar eclipse over parts of Gabon and of central Africa on November, 3, 2013, this momentum grew significantly. Tighter working relations with key national and international stakeholders in the broad space arena are now operational. Past the annular solar eclipse of September 1 2016, we will have moved further ahead and coherently with the ongoing technological and scientific renaissance of a MIGHTY AFRICA. Libreville : Nelson Mandela High School. The next Generation. DOGON's "Sigui Tolo" & " Po Tolo" (Sirius A & B) : A central system in native African astronomy/cosmology. Mr Fernand LEPOKO, a Media & Film industry personality. Mr. LEPOKO is the treasurer of NOMMO ASTRONOMIA. Dr. Patrice M. OKOUMA, the Head of NOMMO ASTRONOMIA. He was the Single Point of Contact (SPoC) for Gabon for IYA2009. Dr. OKOUMA is a key contact to the local educational/research community as well as to different government and non-government institutions, both locally and internationally.